Last week C and I had a little time on our hands as we waited to pick up Nate from camp in Green Bay, so we stopped by Lambeau Field for a visit (and lunch). Before I continue, I need to point out that first and foremost, I'm a Vikings fan, but there seems something special about the Packers and specifically Lambeau Field. As I started to say, we stopped by Lambeau Field and when I parked the van we were looking right into the backyard of this house (see photo insert) across the street from the stadium. As I put the van in park, C gawked with her hand covering her mouth (literally) and gigglingly stammered something to the effect of "what is that?" That my dear would be a 7' replica of the Lombardi trophy, which the Packers won a few years ago (and the Vikings have yet to capture). It just happens to be across the parking lot from the bronze statues of Mr. Lombardi and Curly Lambeau (click photo insert to go to my flickr set and you'll find photos of the statues). We're not new to fanatical football viewing/partying environments. Our former neighbor, Dave, is a huge Vikings fan and every game day he turns his garage into an off-site Vikings stadium. He installed bleachers and has a nicer TV in his garage than he does in his house. Back to this house in Green Bay. It is the most impressive fanatical shrine I've seen, ever. There was another house two doors down from this one that comes in a close second. I particularly like the turn-style gate that allows fans to exit and enter the yard with direct access to the stadium parking lot. I don't know if these people have season tickets to the Packers or not, but I bet they throw some awesome tailgating parties when the Packers play at home and away. 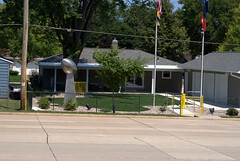 I only wish I could have seen this yard at night with the Lombardi trophy illuminated. Maybe next summer. Side note: As we drove through Green Bay on a Sunday afternoon, I was amazed at how few people there were driving around. Then, we arrived at Lambeau Field. Training camp didn't start until a week later, but the parking lot at Lambeau's atrium was full.